De Arte Tragoediae Divinae does not have hooks or easy selling points. Their album cover is pretty standard and even acts as camouflage in a scene of black and white covers. Additionally, the band boasts 13 minute black death landscapes which smolder over the course of the track and is even segued to the previous song. There is no hype or demo buzz for any previous release and this record is 56 minutes long. 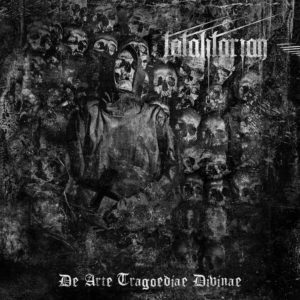 While there are a lot of reasons for this record to get lost in favor of a short black thrash EP, the experience of De Arte Tragoediae Divinae is a blistering hellscape which grows in appreciation each time it beats one into submission. De Arte Tragoediae Divinae has al the right things in place for a fantastic year with an album that comes like a surprise uppercut. Even the slow calculated ruin of songs like “The Flames of Sempiternal Regret” gives this record an unearthly temperament. Though there is little listed regarding this band, Totalitarian is not actively trying to hide from the spotlight rather they are just so far out in the wastes that one has to go travel to them. Once one gets there, it is all internally downhill from there.